It’s a quiet celebration but a celebration nonetheless. (And there will be champagne. And salmon.) As much as I like not working I also love to start teaching again in fall. It really feels like fall today, the temperatures just dropped from “warm enough to swim in a lake” to “maybe we should turn on central heating again”. I also love going back to a more regular life, I only hope that it won’t turn out to include only housework and teaching. We’ll see how that goes. 1. I did not read the books I borrowed from a friend (“Those Left Behind”, and “Quicksilver” by Neal Stephenson) but I read all the books of the “Twilight”-series (sorry, Mad), and a couple of mystery novels. 2. I did play my piano once or twice. 3. I did play my guitar a bit more often than the piano. 4. I spun 200g of combed merino top with my drop spindles. I’m quite pleased with how it went in the end. I would have spun more if I hadn’t decided to get me a spinning wheel. I’ve been waiting for that for ten days now, not wanting to start spinning something on the drop spindle. 5. I almost sew the dress I have been wanting to make since last summer. I spent an afternoon sewing it, then I found that the part where the top and the skirt connect (you know, the waist seam) are not the same width (that’s what happens if you just eyeball everything, especially seam allowances), and use marker that fades over time), I got frustrated and since then I have been waiting to have a bit of free time together with enough patience to fiddle with the seams for as long as it might take to somehow make those two things connect. 6. I sew two reusable grocery bags. One for a friend of mine, and one for me. Now I only have fabric and notions for one more bag around, a bag that will match the summer dress. 7. I went on vacation. 8. I didn’t take my son to the zoo. But we did a couple of other things together. 10. I went swimming two times. In actual natural water. 11. I had my eyes checked, and had my contacts cleaned so that I can wear them again. 12. I didn’t finish the red and the green cardigan I’m working on. But I finished another lace shawl. 13. I didn’t design socks for red cotton yarn and knit them. But I knit my “Poisoned with Chili“-socks, and I even got an award for them. 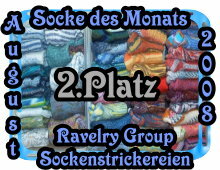 I belong to a ravelry-group for German sock knitters who have a competition for “sock of the month”. What can I say, the winner got one more vote than me. But I’m happy and proud. 14. I didn’t have dinner at the Osteria Italiana. 16. I did more exercise but not quite as much as I had wanted. 18. I wrote two stories that might turn into something longer. I’m really excited. 19. I did get back into the habit of doing housework but not cooking. 20. I didn’t sing and record any improvisations. 1. We didn’t go to the mountains with our son but decided to postpone the mountain hike until next year. 2. We didn’t go to the Olympiaturm with our son, but we went to a Buddhist celebration. 3. We did harvest our own potatoes. They are already eaten up (and they were delicious). 4. We did take a walk to the Andechs monastery with our son (and have some of their delicious beer of which our son doesn’t get any). We had considered this something like a long-ish stroll but to our son it was enough for one day. That was the reason we didn’t go to the mountains this year. Computer problems not withstanding these were about the best summer months we’ve had in years. We also bought a new bed for our son, spent quite a bit of time as a family, sat in beer gardens, and took it easy. It’s summer break, so it isn’t so much about to-do-lists. Now I’m ready for fall. And today isn’t only the last day of summer break, it’s also De‘s birthday. Happy birthday to you, De. I didn’t quite know what to write about her but then I found I had said it all when I wrote her a letter last year. So, let’s drink a bit of champagne again, to a new school year, and another year of bloggy friends. champagne and salmon? Hold on, I can be right there. Actually, I was quite happy with my (one lonesome) beer and take-out pizza. It’s wonderful to hear that you enjoyed your summer. That’s the most important thing. And I am obviously just an amateur list maker. You are the Queen. You know? It sounds like a family paced summer. You did some. You did not do all. And for you a little site I thought you might like if you do not already know of it. Wow, that is some list. You got a lot more accomplished than I did. My hat goes off to you! i love your blog. I also blog about motherhood and the creative life. It’s good to know that we are all in this together.